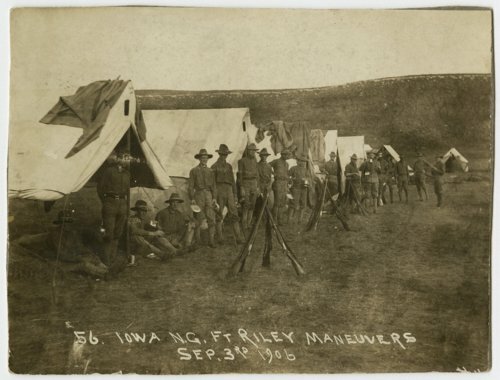 This is a photograph showing the Iowa National Guard on maneuvers at Fort Riley, Kansas. John Harman, third from left, was from Postville, Iowa. He was born July 7, 1881, at Postville, Iowa and died March 25, 1950, at Columbus, Kansas. Harman was a veterinarian in Valley Falls, Kansas, from 1912 to 1949 and the father of Jerome Harman.